« HOME GROWN RASPBERRIES YUM YUM! 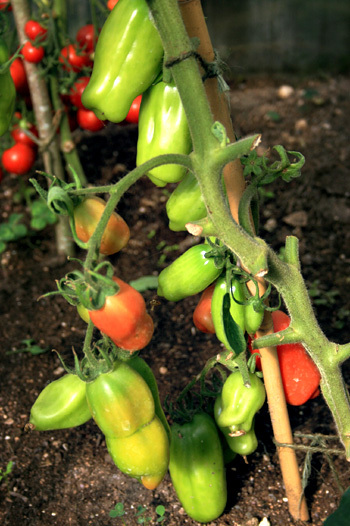 THIS SEASONS TOMATO PLANTS – A TASTE SENSATION? It’s that time of the year when all the hard work we put in to growing tomatoes comes to fruition, and perhaps more importantly it’s the time of year when we conduct our own tomato tasting session at Blackbirds. 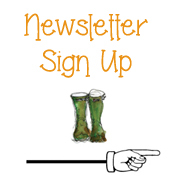 Each year it turns up some interesting results, and this year is no exception! Each year we grow 1 or 2 new varieties, just for the fun of it, nothing serious, it’s really just an excuse for eating freshly picked tomatoes. This year I’ve throw care to the wind and grown 3 varieties, one I’ve grown in the past, and two I’ve never grown before. I like to grow at least one ‘novelty’ tomato in a season, and this year I went for Tigeralla, a striped variety, but more on that later. All three were grown in the Polytunnel using the same growing method, and received the same amount of watering, and supplemented with a high potash feed. 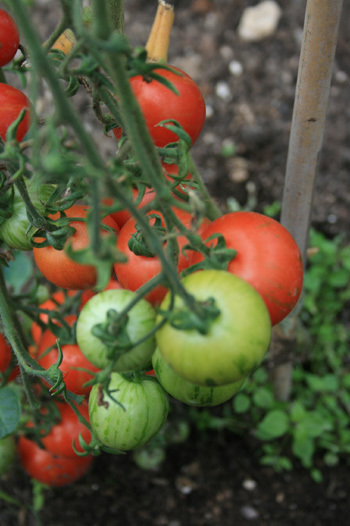 You can find all the details of how we grow our tomatoes in a previous blog, https://ruralgardener.co.uk/2011/05/16/planting-tomatoes-in-the-polytunnel/. First tomato for the taste test is, Cherolla, an F1 Hybrid and my choice for cherry tomato this year. They produce a small perfectly formed tomato and are the most prolific of all the tomato plants I’ve grown this year. The tomatoes hang from long, regular spaced trusses that look like a real work of art. The second tomato up for the taste test is ‘San Marzano Astro F1’, an Italian plum tomato. It’s my first time I’ve grown plum tomatoes, so it should be interesting to find out how they taste. 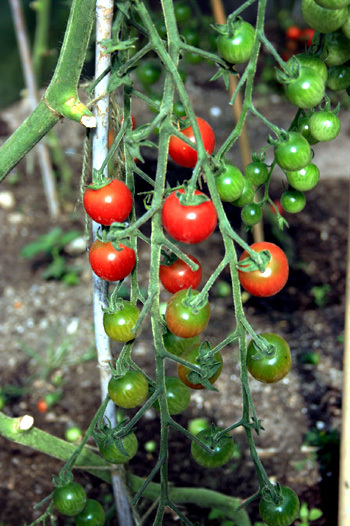 The seeds produce a fairly stocky looking plant with small trusses of typically 4-5 tomatoes per truss. As expected they produced a plum like shaped tomato, with lots of leaf growth. I found I had to remove a fair few leaves so the sun could get to the fruits. I restricted the growth to a single stem by removing all the side shoots, in the same way as if I was growing an Alicante, which in hindsight may not have been the best way to grow this variety. Last but not least we’ve had a go at growing an unusual looking tomato called Tigerella. 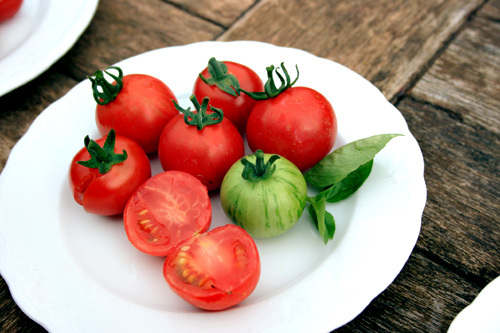 As the name suggests the seeds produce a stripy looking tomato from a standard looking plant. As with all the tomatoes I grew these on a single stem, in bunches of fruit more akin to a bunch of grapes. I thought this would introduce disease to the fruits, but it didn’t and they’ve produced a good crop of tomatoes. On to the taste fest! A gorgeous tasting tomato, and so sweet, not even a hint of bitterness. 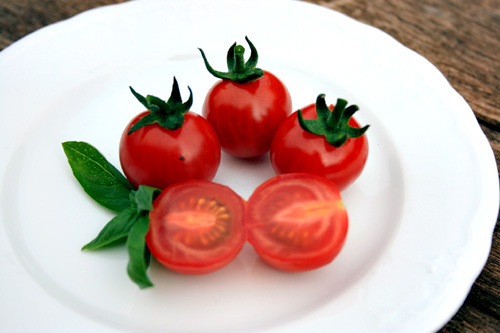 The skins are soft, and the fruits are juicy and have the most gorgeous tomato flavour. For me the most appealing thing about these tomatoes is the size, just pop one in your mouth and wait for the taste explosion! A sure fire winner that I will most definitely be growing again next year. Slightly disappointing taste to be honest. Only because I was expecting to harvest a regular tomato that I might make a tomato salad, or just eat them straight off the vine, but they are clearly grown specifically for cooking. The fruits are fairly tasteless and they are full of flesh. I prefer a juicy, moist tomato, but these haven’t delivered I’m afraid. I will continue to grow them for the rest of the season, and report back on how I got on with them in the kitchen. To be honest they tasted pretty much of a regular tomato, like the old standard Moneymaker tomato, but with a slightly tougher skin and tangier flavour. I found the flavour pretty uninspiring to be honest, especially compared with the Cherolla, but appreciate taste and flavour is a personal thing. They will work in a salad, with all the other flavours adding to the tsate, but on its own it’s not really worked for me. Also the striping is almost no existent when the fruits ripen, which is a little disappointing,, given I grew them partly for effect. I’ll most definitely be growing Cherolla as the taste is superb, the plants are prolific and they are easy to manage. The other 2 varieties have a place in the garden I’m sure, but not for me I’m afraid. Next year I’m planning to grow ‘Marmande’ a beef stake tomato, along with ‘Black Russian’ a popular Heritage variety that I’ve heard produces an amazing flavour. Perhaps you would drop me a note if you have any experience of either of these varieties, or any others for that matter. San Marzano is the definitive tomato for “pasting” or any dish that you would add tomato paste. 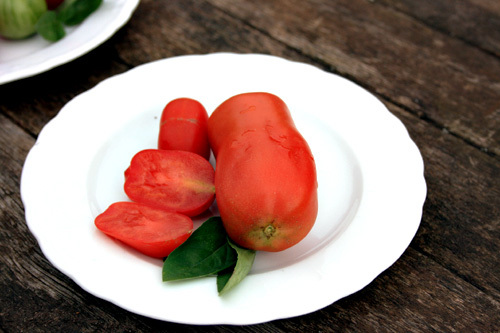 It’s the only tomato to use if trying to capture the “authentic” taste of Italian dishes. I’m not a great fan of F1 anything as superior disease resistance etc always seems to result in compromising the flavour. Please do not give up on this fabulous tomato and you will find that it will quickly become a firm favourite. On your recommendation Chris I will definitely give San Marzano another try.